February 14 is the most romantic day of the year, an important day for all lovers, and this year, I portrayed some of them as wedding photographer Italy Tivoli, the first of the new season! Ancient Tivoli, called Tibur Superbum by Virgil in his Aeneid, has a much longer history than Rome’s and dates back to 1215 BC, when it was considered the most important point of convergence of different peoples. This is borne out by the Sanctuary of Hercules Victor, a structure dating back to the 2nd century BC and still visible today. Today’s image of Tivoli is inextricably linked to its thermal baths and to the three magnificent villas which adorn it: the spectacular Villa d’Este and the archaeological area of Villa Adriana (Hadrian’s Villa), both UNESCO World Heritage Sites, and the landscape view of Villa Gregoriana, run by the FAI (The Italian Environmental Fund). The unique sceneries that emerge from this area were a favourite of poets, painters and rich aristocrats who used to come here in the 19th century during their Grand Tour. The Tivoli “Grand Tour” is a charming trip through the archaeology, history, places of worship and natural sceneries inside Tivoli that you don’t expect – well cared for by the love of its citizens and highly appreciated by tourists and lovers of beauty. Luis and Marta, a couple of very welcome foreign guests in Italy, have chosen the wonderful Tivoli, thanks to the excellent organization of the Wedding Planner Julie Palombaro to celebrate their most important day. And they choose me as a wedding photographer, so happy! A small but lovely group of 11 true friends have participated with joy in a simple and spontaneous wedding where the true feelings were the protagonists, undisputed rulers. My best wishes to Luis and Marta, forever. May you have a long and happy life together. 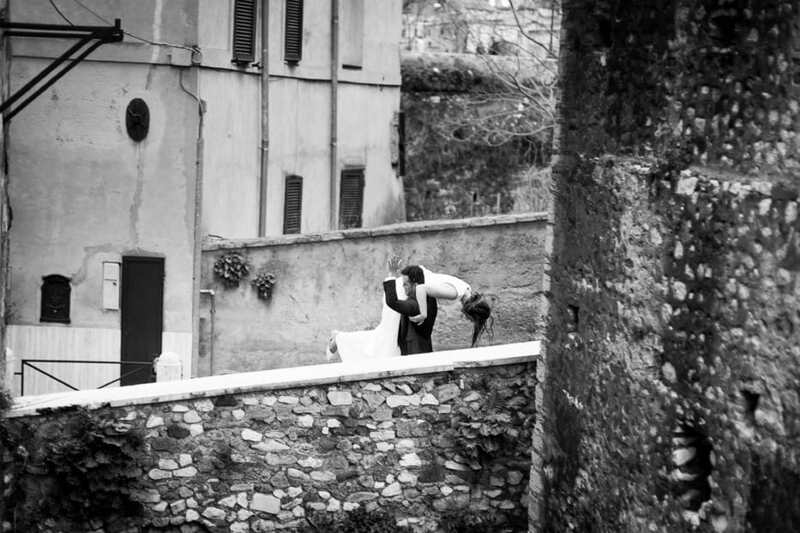 So happy to be a wedding photographer in Italy, this time in Tivoli.